Colonia, Yap. The International Olympic Committee (IOC) has awarded the FSM National Olympic Committee (FSMNOC) a $20,000 Olympic Solidarity Grant for a Technical Course for Coaches for table tennis in preparation for the 2018 MicroGames in Yap. The grant will provide funding to bring an expert instructor sanctioned by the International Table Tennis Federation (ITTF) to Yap from February 11 – 25, 2018. It will also provide funding to send one table tennis coach from each participating nation or island to the training. The course will be held at the Yap Sports Complex where a new table tennis room has recently been constructed in the gymnasium. Participating coaches will enhance their coaching skills and knowledge, get guidance in preparing their teams to compete at the highest levels of competition, and receive comprehensive knowledge in the current rules and regulations of the sport. The intent is also to insure development of the sport of table tennis in the coaches’ own countries by providing strong leadership for the sport. 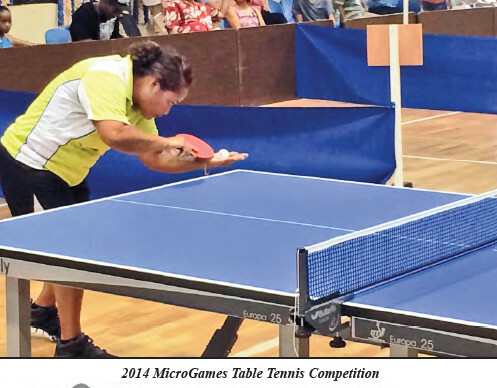 The 2018 MicroGames is a quadrennial event that will take place in Yap July 15 – 27, 2018. Teams from FSM, Guam, Nauru, Palau, Kiribati, the Marshall Islands and the Northern Mariana Islands will compete in Baseball, Basketball, Beach Volleyball, Va’a Canoe, Soccer, Spearfishing, Table Tennis, Track & Field, Volleyball, Weightlifting, Wrestling, Open Water Swimming and the Micronesian All-Around. For more information: www. microgames2018.com.